One of the most common misconceptions about black holes is that they are invisible. In fact, since black holes live at the bottom of extremely deep gravitational potential wells, gas flowing into a black hole will frictionally heat up to millions of degrees and will become extremely luminous in x-rays and ultraviolet ionizing radiation. In fact, some of the most luminous objects in the universe, quasars, are thought to be produced by actively accreting supermassive black holes at the centers of galaxies. A black hole undergoing a quasar outburst can feed at or near the maximum possible accretion rate, the Eddington rate, for millions of years. Quasars outbursts are thought to be the time when supermassive black holes accrete most of their mass, leaving behind the population of quiescent supermassive black holes observed in the centers of nearby galaxies at the present day. Quasars are most commonly observed in distant galaxies at high redshift and by the present epoch, quasars are quite rare, implying that most supermassive black holes in most galaxies are quite faint. This is a troubling fact for observers who wish to confirm the presence of a supermassive black hole in a galaxy more than a few tens of megaparsecs away, let alone in high redshift galaxies. 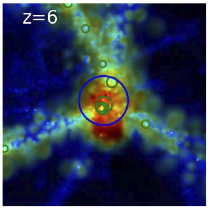 One possible way to directly infer black hole properties is by observing the sort of event discussed in today’s paper: the tidal disruption of an individual star after a close approach to a supermassive black hole. corresponds to the radius of the event horizon of the black hole. Immediately, we see two important things. First, the tidal radius scales as the radius of the star: more extended, evolved stars that have left the main sequence can be tidally disrupted by a pass much further away from the black hole. Second, the ratio of the tidal radius to the Schwarzschild radius scales as the mass of the black hole to the 2/3 power, implying that for a sufficiently large black hole, the tidal radius will be within the event horizon, so that a star with a small radius should be swallowed whole before it can be disrupted. 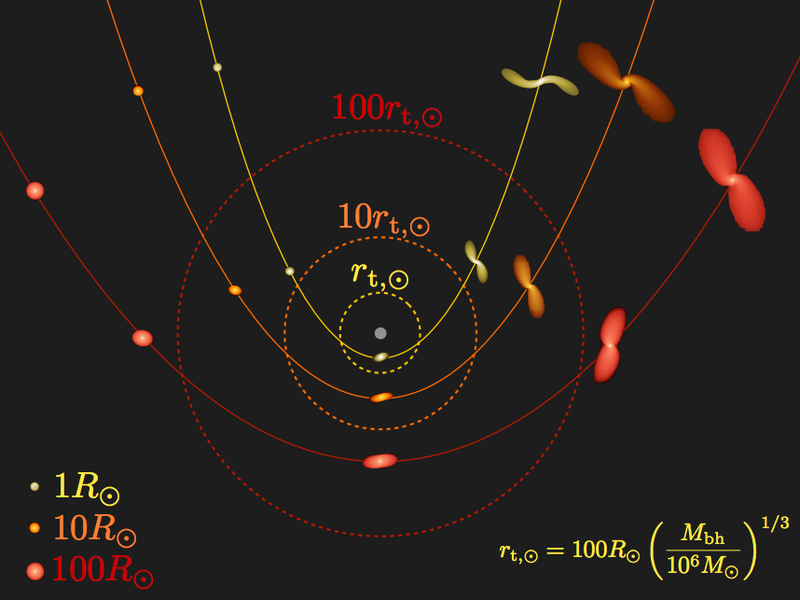 A cartoon, not drawn to scale, highlighting that tidal radius (shown as a dashed line) depends on the mean density of stellar material. As a star evolves off the main sequence and ascends the giant branch its tidal radius (and the corresponding timescales of a tidal encounter) increase by orders of magnitude. Shown here are representative main sequence (yellow), red giant (orange), and asymptotic giant branch (red) stars being disrupted at respectively larger tidal radii. The content of these two equations is summarized quite nicely in the above cartoon from the paper. As stars evolve towards the end of their life on the main sequence, they tend to expand to many times their main sequence radius. Since the tidal radius scales with the stellar radius, it’s much easier to disrupt a more evolved star since the target it must hit to pass within the tidal radius is significantly larger than the target it needed to hit on the main sequence. The last piece of the puzzle is based on well-understood but tricky classical physics: how do stars make their way into eccentric orbits that will deposit them within the tidal radius at pericenter passage? Since a tidal disruption event is a rare occurrence for any given black hole, we know that the population of stars on tight orbits near the black hole probably don’t contribute very much. Instead, the collective N-body interaction of the many stars in the nuclear star cluster will tend to, every once in a while, deposit a star on a rather unfortunate orbit on which it will either by tidally disrupted or swallowed whole by the black hole. The modeling of the nuclear star cluster constitutes the bulk of this paper and unfortunately I can’t devote any more space to it for the sake of brevity. In the left panel, the demographics of stars scattered into orbits that will end in tidal disruption. In the right panel, the demographics of the stars that will end in a disruption flare. Using publicly available stellar models that can predict the radius of a star as a function of time, coupled with hydrodynamic simulations of tidal disruption events and analytic models for the nuclear star cluster, the authors can predict the fraction of stars that get tidally disrupted in either the main sequence, red giant, horizontal branch, and asymptotic giant branch phases of stellar evolution as a function of black hole mass. A summary of these results is plotted above. MacLeod et al. find that the much larger cross-section for an evolved star to be tidally disrupted is offset by the fact that evolved stars are short lived, implying that they are a minority of tidal disruption events around ~106 solar mass black holes. For more massive black holes, an increasing fraction of main sequence stars are swallowed whole, so that evolved stars become the primary food of the most massive black holes, above 108 solar masses. Since these disruption events must occur at large radii, they must take a correspondingly longer time to finish. These long-duration disruption events should be observable in the next generation of transient surveys and may be an efficient way to characterize the stellar populations around massive black holes. Just recently, the PAN-STARRS survey discovered a flare well before it had reached its peak luminosity while observing the inactive nucleus of a relatively distant galaxy at z ~ 0.17. This observation was special because it was the first time a flare had been caught during the relatively short ramp-up phase thought to be associated with the actual disruption event. Previous observed events were found during the long, slow phase of decreasing luminosity as the black hole slowly eats the remains of the star. PAN-STARRS as well as other transient surveys like the Palomar Transient Factory, and the Large Synoptic Survey Telescope are designed to find luminous but short-lived events like tidal disruption flares, and it is certain that we will soon have a statistical sample of tidal disruptions to study in depth. Studies like today’s paper will help us understand the data that is sure to pour in, letting us understand the nature of supermassive black holes and nuclear star clusters with unprecedented fidelity. Nathan is a third year graduate student in Astrophysics at UCSC. His interests include the local ISM, molecular clouds, and the role of star formation in galactic evolution. I don’t mean to be anally retentive, but it should be spelled “pour” in the final sentence. Overall, great article! I enjoyed reading it and learned a lot by searching the internet for other topics when I ran into something I did not understand. Thanks Sam! It should be fixed now.